A very simple Gutenberg plugin built by Andrei Lupu ( @euthelup ) from @ThemeIsle @codeinwp. 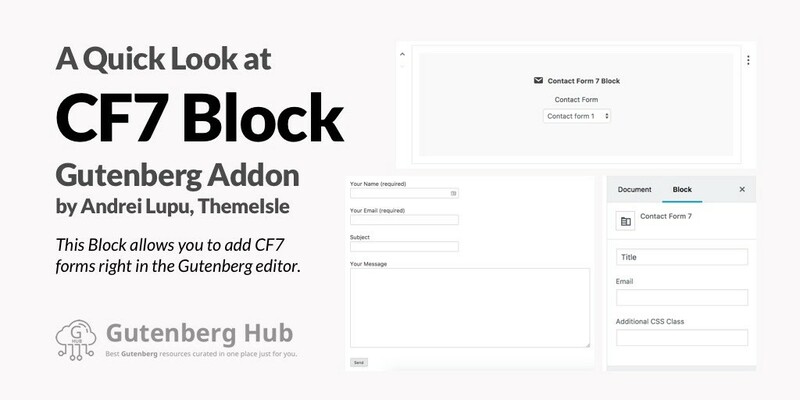 This Gutenberg Addon brings a new block “Contact Form 7” to the Gutenberg Editor. Use this to add your contact form to a page. There are not much fancy options just now. A really simple block to use if you use Contact Form 7 plugin. Originally published at Gutenberg Hub. Best Gutenberg resources curated in one place just for you.